Using ContextManagers to make GUIs even easier. One thing I really wanted to get into appJar, was some indentation - I wanted the code for the GUI to look more like the actual GUI. I also wanted to simplify the creation of containers, and even the GUI itself. 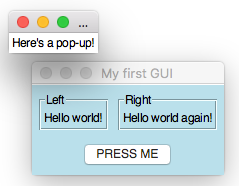 That's it - 2 lines to create a GUI. And, that's all there is to it - this feature is available on all containers, and I think it's going to make things a lot simpler! The old start/stop functions all still exist, so there is no need to use the with command. But if you prefer this method, it's there. An added bonus, is that the same syntax works for starting a container or opening a container! Have a look on the containers page for usage information.